Getting that left (or right) foot working is so important as a drummer. We can give so much to the music by learning how to employ it outside of simply stepping time and using it to open and/or splash the odd hi-hat. We're not talking extreme independence, we're just talking about simple ways of using it to great musical and rhythmic effect by just thinking slightly outside the box. 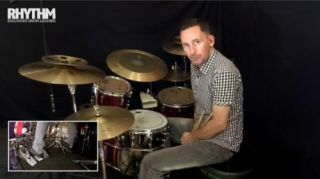 This month we're looking at developing this concept in the context of double pedal work, but not from a metal perspective - gone are the days when the double pedal was something synonymous with metal - this is purely about Augmenting the groove, and it could be any groove in any genre. This is about adding to the music or the song with great effect but without getting in the way of it all. Make sure you get the groove cooking first and if you haven't focused, technically speaking, on what your feet are doing before, start by making sure that as you develop the idea your foot isn't flying off its respective pedal; it should remain in contact with the foot plate and you should aim to remain balanced, central to the kit and relaxed - from the tip of your toe to the last hair on your head - at all times. Watch the lessons - examples 1-4 - below.